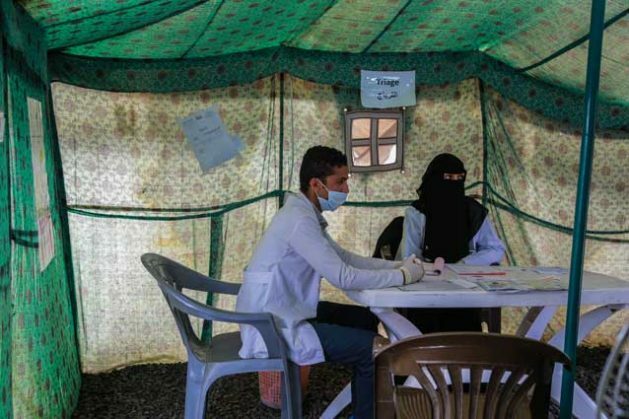 Tents set up at Alsabeen hospital in Sana'a Yemen for screening suspected cholera cases. UNITED NATIONS, Jul 27 2017 (IPS) - The directors of the UN Children’s Fund (UNICEF), World Food Programme (WFP) and World Health Organization (WHO) released a joint statement today shedding light on a deadly cholera epidemic engulfing war-torn Yemen. More than 400,000 cases of cholera are suspected, and nearly 1,900 people have died from associated cases in the last three months alone. The dire situation results from a culmination of factors, such as modern tactics of warfare that destroy water pipelines, as well as continuous bombing of schools and hospitals. More than 60 percent of the population remains uncertain of their next meal as famine looms. Nearly 2 million children are suffering from malnutrition, and are easy targets of the water-borne disease. The report estimates that nearly 80 percent of all children need immediate humanitarian assistance. Amid the lack of adequate international support, community leaders have stepped up to the task—more than 16,000 volunteers visit families from door-to-door to raise awareness about cholera, and assist them with information to protect themselves. Many health-care workers, as many as 30,000, haven’t been paid in nearly 10 months. Still, that doesn’t keep them from their work. Similarly, international organisations like UNICEF and WHO have set up nearly 1,000 diarrhoea treatment centers to provide key supplies, like food and medicine. They are also similarly assisting, with the help of the community, to rebuild the local infrastructure. There is hope, and more than 99 percent who are now showing cholera-related symptoms have a good chance of surviving. The two-year deadly conflict in Yemen between the Saudi-led Coalition (SLC) and Houthi rebels in one of the most poorest Arab countries has produced devastating results—one report in 2016, which was quickly withdrawn, estimated that nearly 60% of children died from attacks by the SLC. The UN agency leaders, Anthony Lake (UNICEF), David Beasley (WFP) and Tedros Adhanom Ghebreyesus (WHO) urged the international community to “redouble its support for the people of Yemen,” following a trip to the country themselves.